The Legend of Zelda (ゼルダの伝説, The Legend of Zelda) is the first game in The Legend of Zelda series, designed by Shigeru Miyamoto and published by Nintendo for the Nintendo Entertainment System. It was released in 1986 in Japan, and later released in NTSC regions in 1987. It appears as a Masterpiece in Super Smash Bros. Brawl and Super Smash Bros. for Wii U. In Brawl, it can be played for 120 seconds. In Smash Wii U, it can be played for 240 seconds. Link and Zelda debuted in this game. Ganon, the Prince of Darkness, aimed to plunge the world into fear and darkness under his rule. Fearing this, Princess Zelda split up the Triforce of Wisdom into eight fragments and hid them through the lands of Hyrule. She also commanded her most trustworthy nursemaid, Impa, to find a man with enough courage to destroy the evil Ganon. Upon hearing this, Ganon grew angry, imprisoned the princess, and sent out a party in search of Impa. Link saved Impa and went on a journey to collect the Triforce fragments and save Zelda. The Boomerang, the Hero's Bow and the Bombs are weapons that first appeared in this game. All of them are used by Link, Young Link and Toon Link in their special moves, though some of them used different versions of these weapons. The boomerang, while generally inferior to the Bow as a means of indirect attack, is reusable, capable of pulling items back to Link, stuns enemies, and trigger switches, making it more of a tool than a true offensive weapon. The bow can be used to fire arrows and defeat enemies from a distance. Bombs can be placed in the ground and explode after a short time. They damage enemies and can also be used to break walls and find secret rooms. The Heart Container first appeared in this game. These items can be earned by defeating the bosses in dungeons and add another heart to Link's health gauge. The enemies Bubble, Darknut, Octorok, Like Like, Peahat and Stalfos first appeared in this game. Bubbles are invincible, but they do not cause damage. A touch from them causes Link to be unable to use his Sword for a short time. Darknuts come in red and blue types, with blue being the stronger of the two. They move slowly and are only a danger for Link when he comes in direct contact with them. Only attacking them from behind or the side will hurt them, and touching them causes Link a lot of damage. Octoroks come in red and blue types as well, and the blue ones are stronger. They attack by spitting rocks. Peahats are the spirits of dead flowers, fluttering around the screen in packs. They flutter about the screen and can only be harmed when they stop moving. Stalfos are skeletons that block attacks with their shields. However, when their attention is focused in front, they're very vulnerable to attacks from behind. 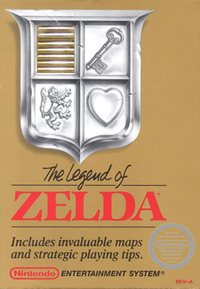 "Hyrule Castle", "Great Bay", "Main Theme (The Legend of Zelda)", "Title (The Legend of Zelda)" and "Main Theme / Underworld Theme (The Legend of Zelda)" come from this game. "Hyrule Castle", "Great Bay" and "Main Theme (The Legend of Zelda)" are remixes of the game's overworld theme, which serves as the main theme for the whole Zelda series. "Title (The Legend of Zelda)" is a remix of the songs that plays in the title screen of this game. "Main Theme / Underworld Theme (The Legend of Zelda)" is a medley of the main theme and the dungeon theme of this game. Link's, Zelda's, Ganondorf's, Sheik's, and Toon Link's victory themes are a remix of the tune that plays when Link obtains a Triforce Piece. Young Link's victory theme is a remixed portion of the main theme of this game. In Super Smash Bros. Brawl, Link's lavender costume is based on that corresponding color when equipped with the Blue Ring. This page was last edited on April 13, 2018, at 03:43.